Cereal spokespersons and their catch-phrases linger in our minds longer than the processed sugar from the cereal we consumed at their command does in our bodies. Tony the Tiger roared "They're great!" Remember the Dean Martin inspired Sugar Bear who insisted that he couldn't get enough of Super Sugar Crisp? How about Franken Berry and Count Chocula bickering over who represented the best tasting cereal? Do you recall how the Trix rabbit tugged at our heart-strings every time he was denied a bowl of Trix? Remember the Captain Kangaroo influenced Cap'n Crunch and his adventures with cereal at sea? All of these characters have earned their place in the Cereal Icon Hall of Fame, but the brightest stars from the '60s has to be Quisp and his mock-rival (similar to the General Mill's Franken Berry and Mr. Chocula rivalry from the '70s) Quake. The Quaker Oats Company loaded up the shelves with both of these cereals in 1965. Quisp was supposed to provide "Quazy Energy", and was represented by a batty googly-eyed space alien. Quake cereal promised "Earthquake-Power" and was promoted by a no-frills stodgy miner. Despite all of their struggles for recognition as the best, the two cereals were virtually indistinguishable in taste. In fact, if memory serves, wasn't Quisp and Quake similar to a bowl of Cap'n Crunch? 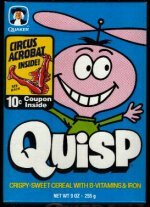 The commercials and artwork, featuring Quisp and Quake, were done by Jay Ward of Rocky & Bullwinkle and George of the Jungle fame, and were very successful. All children's cereals came with premiums in the bottom of the box, and Quisp and Quake were no exception. Here is a list of some of the prizes and mail-aways. Quake swam through his last mountain in the early '70s. While Quisp had won the war, his circulation has been somewhat limited ever since. You can still find him fluttering around in some parts of the country, and the good news is - the cereal still tastes the same.